One converter/adaptor to allow a Micro SD card to be used in a Memory Stick Pro Duo slot. 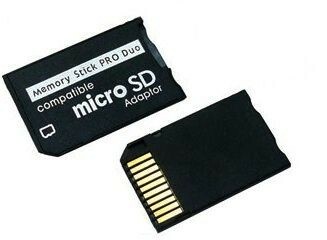 Compatible with all devices which use a Memory Stick Pro Duo slot such as PSP, Sony cameras, Sony mobiles, etc. It is approximately 31mm x 20mm. It will work with SD or SDHC cards up to 32GB.